This easy recipe for Polish dill pickles or ogórki kiszone (oh-GOORR-kee kee-SHOH-neh), which literally means pickled cucumbers, was adapted from one by Marcin Filutowicz, professor of bacteriology at the University of Wisconsin at Madison. The beauty of this recipe lies in its adaptable yield. You can make just a 1-quart batch or as many quarts as you like and they come out perfectly every time. Salt and naturally occurring lactic acid are the only preservatives in these pickles, so using bottled water and pickling or kosher salt are critical. Canning or water-bath processing is not required. The ingredients listed are for a 1-quart yield which will serve 8 to 10 people. The pickles will be ready to eat in five to six weeks unless you use the quick-eating pickle (ready in two to three weeks) instructions outlined in the note below. Place mustard seeds, 1 clove garlic and dill in a sterilized quart jar. Tightly pack the pickling cucumbers in the jar, positioning the last one horizontally to help keep the cucumbers below the brine. Top with remaining garlic clove. Dissolve the salt (for crisp pickles, you must use bottled water and either pickling salt or kosher salt) in the bottled water. Fill the jar to within 1/4 inch from the top. Cover the jar loosely with a sterilized cap and keep in a cool place (55 F to 60 F). The jars must not be closed too tightly because as fermentation takes place, the accumulated carbon dioxide must be able to escape. Some oozing of brine is unavoidable, so store in a place where seepage won't be a problem. Fermentation typically takes five to six weeks. When fermentation is complete, tighten the lids. If lids are tightened too early, the trapped carbon dioxide will make the pickles mushy. If lids are not tightened after fermentation, spoilage can occur. 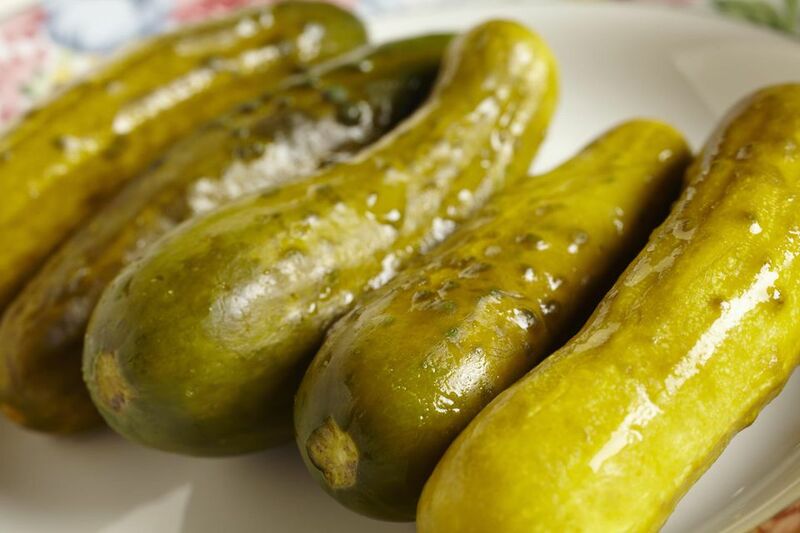 Note: Quick-eating pickles (ready in two to three weeks) can be made by reducing the salt to 1 1/2 tablespoons per quart of bottled water and allowing fermentation to take place at room temperature (70 to 75 degrees). Source: Adapted from a recipe by Marcin Filutowicz, professor of bacteriology at the University of Wisconsin at Madison.